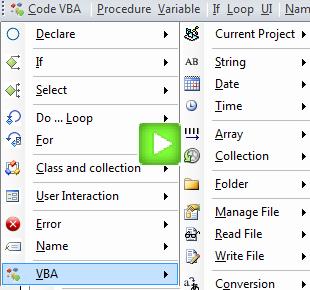 Click on image below to start the Code VBA demo screencast to get a quick impression what it will do for you (49 seconds, 600kb). The easiest and most common way to interact with users when making VBA macros is by using InputBox and MessageBox. This article inroduces a third dialog, the SelectionBox. The SelectionBox dialog contains a listbox and Ok and Cancel buttons. It can be called in two ways allowing the user to either select only one item from the list, or multiple. By specifying the Prompt text it is indicated that selection of a value is mandatory. The code below shows how to open the SelectionBox dialog with the listbox filled with sample values allowing the user to select one value only, and print the selected value - if any. 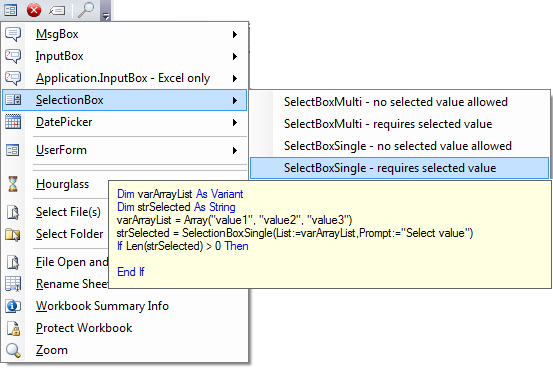 The code below shows how to open the SelectionBox dialog with the listbox filled with sample values allowing the user to select multiple values. The first of the selected values is printed - if any. 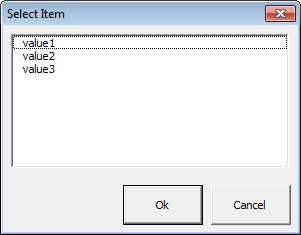 The use of argument Prompt:="Select one or more values" is programmed in the SelectionBox UserForm to result in the Prompt message if the user has not selected any values. The implementation modules modSelectionBox and FormSelectionBox are added to the VBAProject.